Are you losing weight? Are your wounds healing more slowly? Has your endurance dropped? If so, you may have a zinc deficiency. This mineral is essential to maintaining good health and optimizing athletic performance. In fact, athletes need to pay special attention to their zinc consumption because of its key functions in the body. Healthy cell division and metabolism depend on having enough zinc; it aids in repairing your tissues after exercise. Zinc also plays a role in hormone production, including testosterone, which is essential for building lean muscle mass. You need zinc to maintain a strong heart and respiratory system, as well as healthy cholesterol levels. Increase your aerobic capacity - Your “VO2max”, or aerobic capacity, is a measurement of how much oxygen your body is able to supply to your muscles—which can limit your athletic performance if the amount is too low. Research has shown that adequate zinc levels improve VO2 max. Click here to learn how InsideTracker can provide you with personalized nutrition recommendations that can increase your zinc levels! Strengthen your immune system and decrease inflammation – When a virus or bacteria invades your body, zinc travels to key cells that help fight against infection and ensures that inflammation does not spiral out of control in the body. Having adequate levels of zinc means you are less likely to be sick and more likely to recover quickly, so that you lose less training time. Improve your bone health – Athletes who have low levels of zinc are at risk for decreased bone mineral density, which can lead to bone fractures. Zinc is necessary to form collagen tissue, to unite bone fractures, to heal wounds, and to prevent osteoporosis. How do you know if you’re not getting enough zinc? The most reliable way to know whether you are consuming enough zinc is to have a blood test, such as the InsideTracker Ultimate Plan. InsideTracker’s blood analysis will show exactly what your levels of zinc are and whether they are optimal for you. You may also notice some signs of zinc deficiency, such as decreased appetite, low energy, and reduced endurance. Other symptoms include white spots, bands, and lines on finger nails; hair loss; skin rashes; acne; diarrhea; poor eyesight; and impaired taste, smell and memory. Athletes may be at greater risk for zinc deficiency because you lose zinc when you sweat. Wrestlers, gymnasts, and other athletes who eat less to control their weight may fail to consume enough zinc. Vegetarian and vegan athletes have a greater risk of zinc deficiency since many zinc-rich foods are animal products. Also, because zinc from non-animal foods is harder for your body to absorb, vegetarians may require as much as 50 percent more zinc than meat-eaters. Vegans and vegetarians typically eat high levels of legumes and whole grains, which contain antioxidant compounds called phytates that work to bind zinc and inhibit its absorption. Finally, endurance athletes who follow a high carbohydrate diet that is low in proteins and fats may be at increased risk for zinc deficiency. What are some of the best dietary sources of zinc? You can also increase the amount of zinc available in your diet through food preparation techniques, including soaking beans, grains, and seeds in water for several hours before cooking and allowing them to sit after soaking until sprouts form. Vegetarians can also increase their zinc intake by consuming more leavened grain products, such as bread, rather than unleavened products, such as crackers. People who want to increase their blood levels of zinc should avoid foods rich in phytates (such as broccoli, grains, and legumes) and iron, copper, and calcium supplements because they inhibit zinc absorption in your gut. To make sure you’re getting enough zinc, men should aim to consume 11mg per day, and 8mg per day for women (women who are pregnant or nursing need about as much zinc as men). You can get zinc from many different foods; three ounces of beef tenderloin provides 4.4 mg of zinc, ½ cup of baked beans has 2.9 ounces, and 8 ounces of low-fat yogurt has 1.7 mg. If your zinc is too low, you may want to talk to your doctor about taking a zinc supplement. To improve absorption of a zinc supplement, take it with a meal containing zinc-rich foods. You can also increase zinc absorption by choosing a supplement made from zinc acetate or zinc sulfate because these are soluble. But be sure that you don’t overdo your zinc consumption. Too much zinc can reduce your levels of HDL cholesterol and may contribute to unwanted weight loss. Excess zinc can also impair your immune system. 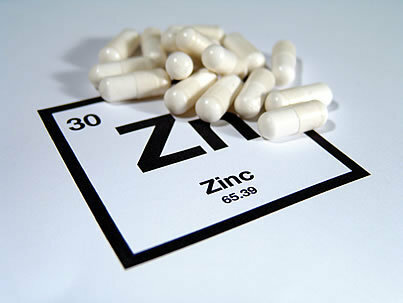 Consuming very large amounts of zinc can result in zinc toxicity which causes nausea, vomiting, diarrhea, and headaches. The recommended upper intake level for zinc is 40 mg per day. An InsideTracker blood test offers the best way to monitor your zinc levels and be sure that you get enough but not too much. If you need help with finding zinc-rich foods you like, InsideTracker nutrition software provides personalized food recommendations to dial in your optimal zinc levels. Zinc is just one of 32 biomarkers and ratios that InsideTracker measures and analyzes. Learn more about all of them in our handy, FREE e-book!